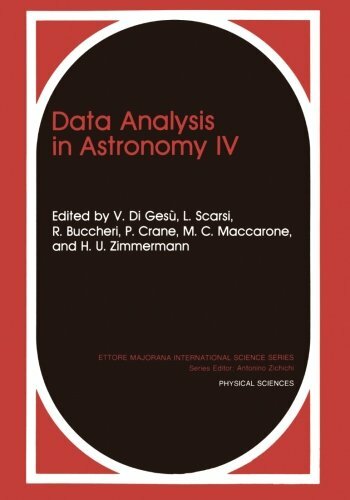 Amazon.com description: Product Description: In this book are reported the main results presented at the "Fourth International Workshop on Data Analysis in Astronomy", held at the Ettore Majorana Center for Scientific Culture, Erice, Sicily, Italy, on April 12-19, 1991. The Workshop was preceded by three workshops on the same subject held in Erice in 1984, 1986 and 1988. The frrst workshop (Erice 1984) was dominated by presentations of "Systems for Data Analysis"; the main systems proposed were MIDAS, AlPS, RIAIP, and SAIA. Methodologies and image analysis topics were also presented with the emphasis on cluster analysis, multivariate analysis, bootstrap methods, time analysis, periodicity, 2D photometry, spectrometry, and data compression. A general presentation on "Parallel Processing" was made which encompassed new architectures, data structures and languages. The second workshop (Erice 1986) reviewed the "Data Handling Systems" planned for large major satellites and ground experiments (VLA, HST, ROSAT, COMPASS-COMPTEL). Data analysis methods applied to physical interpretation were mainly considered (cluster photometry, astronomical optical data compression, cluster analysis for pulsar light curves, coded aperture imaging). New parallel and vectorial machines were presented (cellular machines, PAPIA-machine, MPP-machine, vector computers in astronomy). Contributions in the field of artificial intelligence and planned applications to astronomy were also considered (expert systems, artificial intelligence in computer vision).